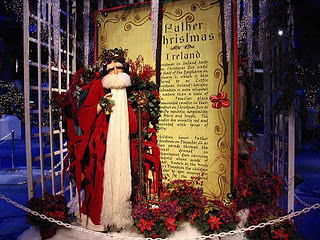 Nollaig Shona Dao'ibh, (NO-lihg-HO-nuh-JEEV), "You have a happy Christmas" would be behind you in Ireland the same as in the USA. Today it is La Fheile Steiofan (St. Steven's Day) or La an Dreoilin (Day of the Wren). In the UK and Canada the day following Christmas is tradionally known as BOXING DAY. It was the day when wealthy people would give a box containing a gift to their servants. 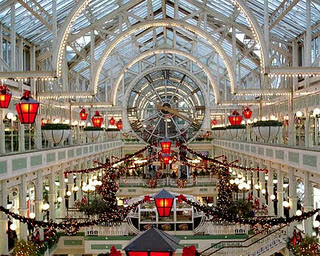 In America this year, December 26th is expected to be the 3rd busiest shopping day of the year, edged out only by BLACK FRIDAY and the Saturday before Christmas. 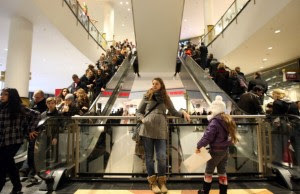 It is anticipated that 60% more shoppers will hit the stores this year than last year. In a tradition of many years standing, my wife, Julie, will meet with her son, Randy, his wife, Jennifer, friends, Marty and Renee at the same Cracker Barrel at 6:00AM for breakfast. There, they will plan their shopping strategy for each of them before they reassemble for lunch. THEY GET SO EXCITED DOING THIS! Jammed escalators and stores is just part of the fun. Not for me! It is so quiet in the house, time for me to join my friend here for my first nap of the day. Hmmmmm! I prefer to remain in this peace and quiet of home, safe and sound. How do I know I'm safe? Why, my giant schnauzer is on guard right behind me in the doorway of my office. Uh, yes, he is sound asleep with his rawhide treat. Should push-come-to-shove, Gunner has agressively demostrated many times his instant willingness to put himself between me and what he considers danger. The only question this morning, what would he protect first, me or his rawhide treat? You know what? He can do both quite efficiently! My blog has only been read twice in Ireland and that is just recently. I would love to have more Irish readers. ACTUALLY, IT IS ONLY 8:15AM HERE AND SO FAR TODAY MY BLOG HAS BEEN READ 23 TIMES IN JAPAN COMPARED TO ONLY 22 TIMES IN THE USA. I sincerely appreciate my Japanese readers and all you other readers everywhere.